These categories recognize excellence in apps for handheld and tablet devices, and for PCs, issued or updated since January 1, 2012. These categories recognize excellence in annual reports, brochures, marketing and sales kits, house organs (corporate magazines), and other publications issued since January 1, 2012. These categories recognize excellence in live events staged since January 1, 2012. These categories recognize excellence in videos produced for a business- or work-related purpose that were first released or otherwise made public since January 1, 2012. These categories recognize excellence in web sites and blogs. There is no eligibility timeframe for these categories - it doesn't matter when the site or blog was first published. If you have last minute questions, please don't hesitate to email us at help@stevieawards.com or call us at + 1 703-547-8389. Akihito Tsukioka, founder of Digitized Information, Inc., in Tokyo, Japan, is Chair of the committee for final judging of the annual report awards and other literature categories, website awards categories, app awards categories, video awards categories, and live event awards categories of The 2012 International Business Awards. (Sign up here to receive information on how to enter The 2013 International Business Awards, the world's premier business awards competition, opening in January.) We recently caught up with him in his busy DigInfo TV office in Tokyo. What do you think are most exciting ideas/innovations that have been posted on DigInfo TV in the past year? The Ubi-Camera, which takes photos composed by framing them with your hands. A research group at the Institute of Advanced Media Arts and Sciences in Japan is developing this prototype miniature camera. When you draw a picture or take a photo, you sometimes form a rectangle with your hands to decide the composition. With this camera, you can take a photo using the exact same motion. The camera contains a range sensor, and the framing is determined by the distance between the camera and the photographers face. With the current system, which is still in development, the lens has a fixed focal length, and zooming is done digitally on a PC. The True 3D display technology, developed by Burton, which uses a laser to create luminous points of light at desired locations in air or underwater. This system is an evolved version of technology co-developed by AIST and Keio University, first announced in 2006. It works by focusing laser light to produce plasma excitation from the oxygen and nitrogen in the air. The researchers state that this is the world's first technology to show pictures without the constraint of a screen. Most current 3D devices project pictures onto a 2D screen, and make the pictures appear 3D through an optical illusion. But this device actually shows images in mid-air, so a feature of this system is that it enables 3D objects to be viewed naturally. A research group at the Tokyo University of Science, led by Associate Professor Shinichi Komaba, has confirmed that hard carbon obtained by pyrolyzing sucrose, the main constituent of sugar, is an effective anode material for sodium ion batteries. Currently, most rechargeable batteries are lithium ion batteries. Japan imports its entire supply of lithium, a rare metal, so lithium ion batteries are expensive. Sodium ion batteries are intended to overcome lithium's disadvantages of high price and scarcity. The supply of sodium is unlimited. Also, sodium ion batteries can be made using iron, aluminum, and sodium, rather than cobalt or copper as before. What's more, results show that using carbon made from sugar as the anode can increase battery capacity. So high-performance batteries may be achievable using cheaper, more abundant materials. The Komaba Group has achieved a storage capacity that is 20% higher than that of conventional hard carbon. It's expected that many researchers will work on making sodium ion batteries commercially viable. The Komaba Group anticipates it may take about five years to achieve a practical version. Dropbox, a free service that stores info across computers, mobile phones, tablets, whatever. The awareness that I will discover something new with each new day. Akihito Tsukioka has been in the translation business for over 25 years. He also has experience in public relations and communications. 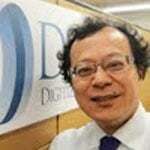 Akihito founded Digitized Information, Inc. in 1986. The company provides its customers with tailor-made video production and translation services. Its website, http://www.diginfo.tv/, receives 70,000 views per day on YouTube. Mr. Tsukioka received a master's degree in city planning from the University of California, Berkeley, and is based in Tokyo, Japan. Digitized Information is a Tokyo-based video production/translation company providing videos of the latest cutting-edge technology and products from Japan in both English and Japanese. Established in 1986, the company employs a small team of video production staff in Japan, and works with a number of translators in various time zones. 1. Review the awards categories. These categories recognize excellence in apps for handheld and tablet devices, and for PCs, issued or updated since 1 January 2011. These categories recognize excellence in all information technology, software, web development, etc. functions. These categories recognize excellence in all product management, product development, product engineering, manufacturing, etc. functions. 2. Review the entry submission criteria. Make sure your entries include all required submission information. 3. Review past winners' entries. Get inspiration and guidance from past winners. The 8th Annual International Business Awards were presented in October 2011 in Abu Dhabi, the United Arab Emirates. Honorees included American Express, Bombardier, Inc., Etisalat, Everything Everywhere, Saudi Basic Industries Corporation, Siemens AG, TATA Motors, Tesco Poland, Toyota Motor Corporation, Turk Telekom, and Unilever N.V., among others. 2011 results are summarized at http://www.stevieawards.com/pubs/iba/awards/408_2219_21081.cfm. Select your categories, write your submissions according to the instructions, and submit your entries. Winners of the competition will be celebrated at the ninth annual awards banquet on Monday, 15 October at the Ritz-Carlton Hotel in Seoul, South Korea. Need helping choosing the best category to highlight your emerging technology? Contact us at help@stevieawards.com and we'll help direct you to categories that are right for your organization. Want more ways to highlight your organization's innovations­? Submit an entry for Most Innovative Company of the Year. As the entry deadline for The 2012 American Business Awards approaches on Wednesday, March 28 we'd like to highlight several innovation awards categories that may be of interest to your organization. If you haven't already received your entry kit for The 2012 American Business Awards, the premier business awards program in the U.S.A., you can request your entry kit here and you will receive it right away. Recognizing overall achievement in product and/or marketing, sales, manufacturing, management, etc. innovation. Recognizing companies that began operations since January 1 2010. Recognizing outstanding revenue growth since the beginning of 2011 over 2010. Recognizing singular innovations in product and/or marketing, sales, manufacturing, management, etc., by an organization or an individual. Recognizing singular innovations in technology, new products, etc., by an organization or an individual. All entries in these categories require an essay of up to 500 words describing the nominated organization's achievements since January 1 2011, a biography of the leader(s) of the nominated organization of up to 100 words, and an optional (but highly recommended) inclusion of a collection of supporting files and web addresses that you may upload to our server to support your entry and provide more background information to the judges. Not going to make the March 28 deadline? Don't panic, entries can still be submitted through the final deadline of April 25 with a late fee of $35.00. a. An essay of up to 100 words describing the app's purpose and results to date. Include here the platforms your app supports. b. The app itself, in the form of a demonstration video of up to three (3) minutes in length, or a URL to the app. In either case you must attach the demonstration video or the URL to your entry through our attachment/link uploading tool online. c. Optionally, you may list creative and production credits for your app - a list of the people and organizations that contribute to its development. All app awards will be presented at the ABA's new tech awards ceremony in San Francisco in September 2012. Learn more about the event. Have a favorite smartphone or tablet app? Request an entry kit and nominate your favorite app!